ANCHORAGE, Alaska, December 9, 2009 (ENS) – Ice plugged an inactive pipeline, causing it to burst, officials said Tuesday in an attempt to explain how 46,000 gallons of crude oil spewed onto the tundra near a BP Exploration processing center at Prudhoe Bay on Alaska’s North Slope. The oil leak near BP’s Lisburne Processing Center was discovered during a routine inspection by a company worker on November 29, say state and company officials, but the ice in the ruptured pipe was not visible until Monday. The spill is one of the North Slope’s largest by volume, officials believe. Separate investigations by BP and the State of Alaska into the cause of the leak are ongoing. The 18-inch above-ground pipeline transports a mixture of produced water, oil, and natural gas, but it was not in operation at the time of the incident. The pipe is no longer leaking, and cleanup of the spilled oil is underway. At least three-quarters of an acre of tundra was fouled and officials say that more than half of that area is oil-misted snow and the rest is covered with an oil and water mix. Environmental impacts to the area appear to be limited by cold weather, adjacent gravel road and natural barriers, which prevented the release from affecting a larger area, cleanup officials said. 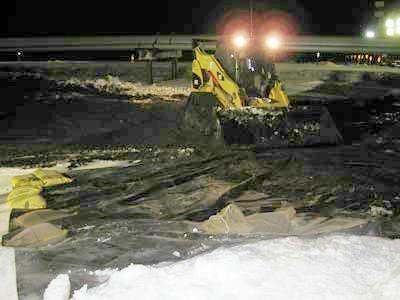 The first phase of the cleanup focused on removing snow contaminated by oily mist during the spill. That effort involved 12 workers using hand tools and was completed last week. Working in icy cold and near darkness, responders first built an ice pad to provide a safe space to stage response equipment and supplies near the spill site and an ice berm around the spill site to contain the oily mess. The rest of the spill will be collected and transported off-site over an ice-road that is being constructed for the purpose. As the work-day ended today 1.1 miles, or approximately 90 percent, of the ice-road was complete. BP Exploration Alaska, continues the moving of contaminated snow across the tundra using rolligon equipment. A rolligon is a specialized, low-impact, off-road vehicle. The rolligon will be replaced with flatbed trucks once the ice-road is complete. Spill response personnel now number 108, including 75 on the Slope and 33 in Anchorage. Equipment marshaled on site includes five front-end loaders and other mechanized equipment, at least 10 generators, and lights to allow workers to safely operate in the dark hours. There is less than an hour a day of daylight at Prudhoe Bay this time of year. BP Exploration is still on probation for a 2006 North Slope oil spill after pleading guilty to a misdemeanor and paying $20 million in fines and compensation. That spill was blamed on a corroded pipeline.